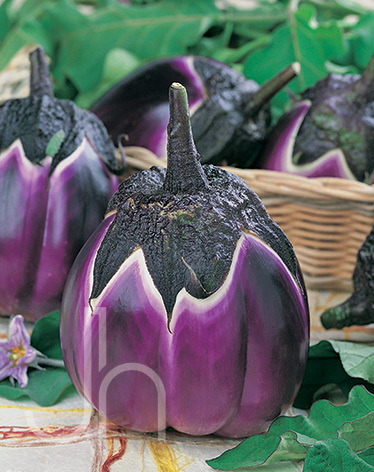 Rosa Bianca Eggplant starts out with beautiful lavender blooms that produce rosy, pink oval-shaped fruit. It has a creamy consistency and a never bitter, delicate flavor in 8 inches of culinary goodness. Outstanding Features: Very showy and attractive to consumers. Transplant after the danger of frost has passed when the soil is thoroughly warm. Eggplants are heavy feeders. Fertilize with 2-3 tablespoons of ammonium nitrate per 10 feet of row after the first harvest and every 3-4 weeks after that. Spacing: Plant 24″ apart in 40″ rows. Tips: Eggplant is somewhat drought tolerant and should not be overly watered as this may cause the plant to develop root rot. Mulching can help to keep the plant moist and watering can be increased once flowering has occurred. Since Eggplant is a heavy feeder, you may need to provide it with extra fertilizer to produce a good crop.